Kappppooooowwwwwww! 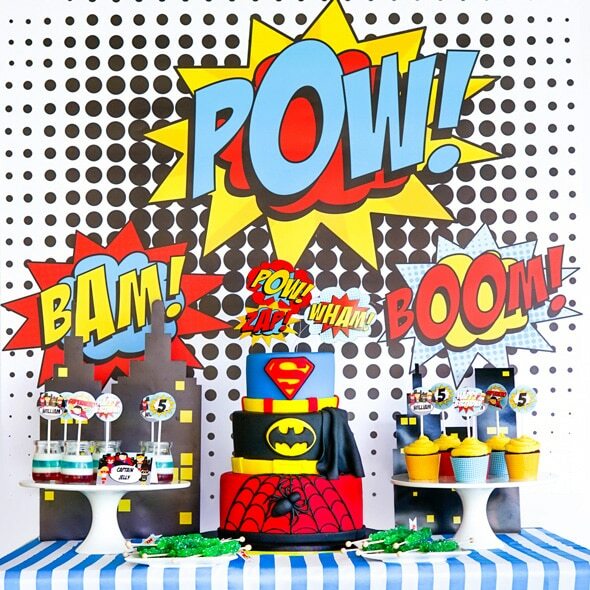 Whoosh, Zap, Bam … nothing subtle or gentle when it comes to a boy’s POW-erful Superhero Birthday Party! 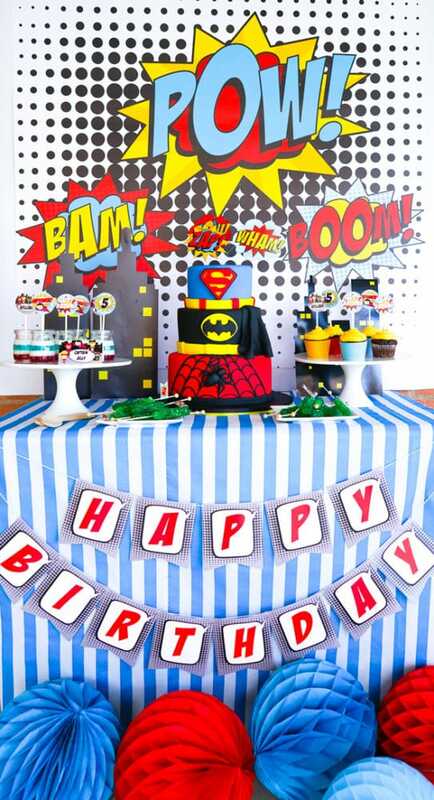 Superheroes is one of those party themes that every boy wants at least once. 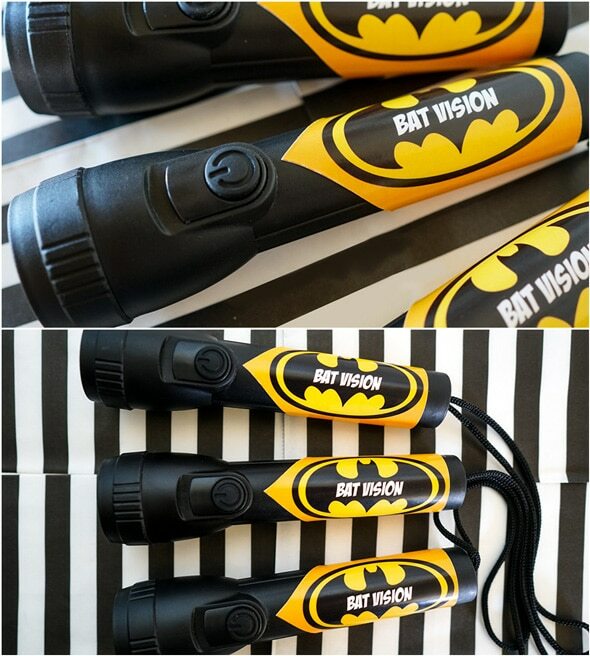 Think bat mobiles, super powers, alter-egos, night vision, flying, capes, and of course, saving the day! 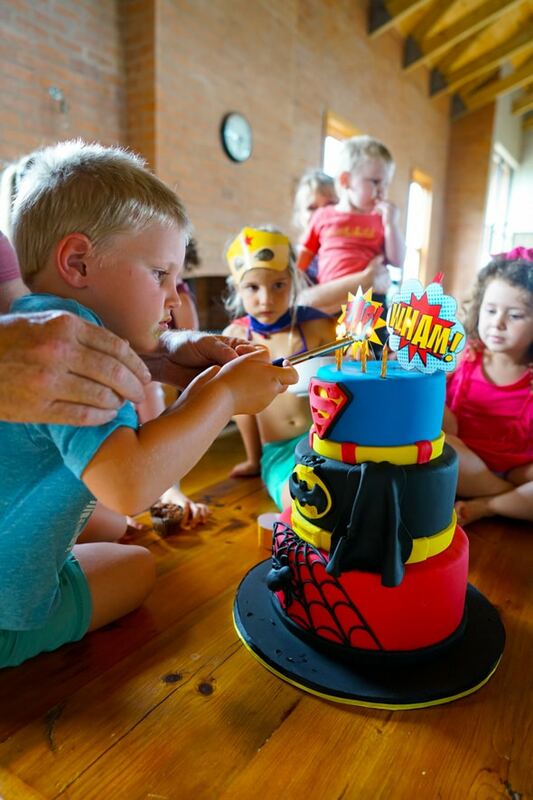 This little guy wanted a power-packed fifth birthday party. He wasn’t content to choose ONE of the ‘big three’ (Superman, Spiderman and Batman), though. 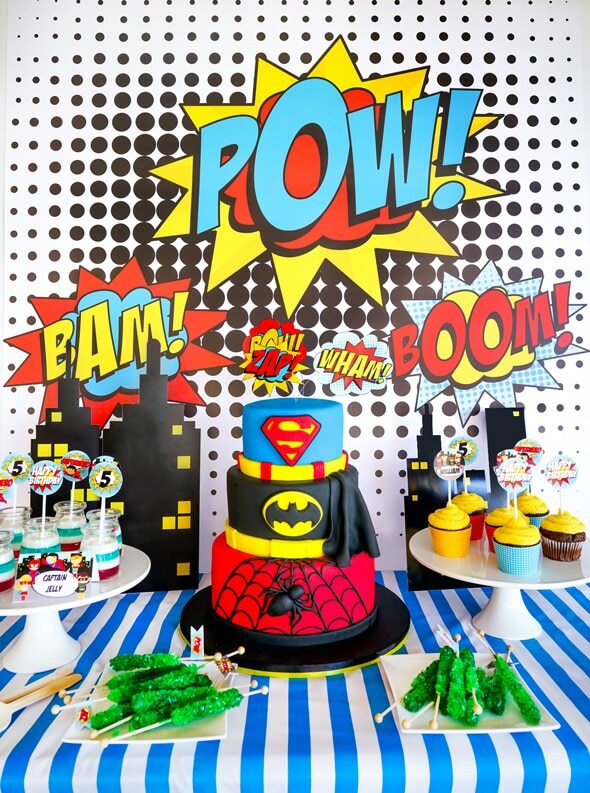 Why have one when you can have all of your favorite superheros together and eat cake at the same time? 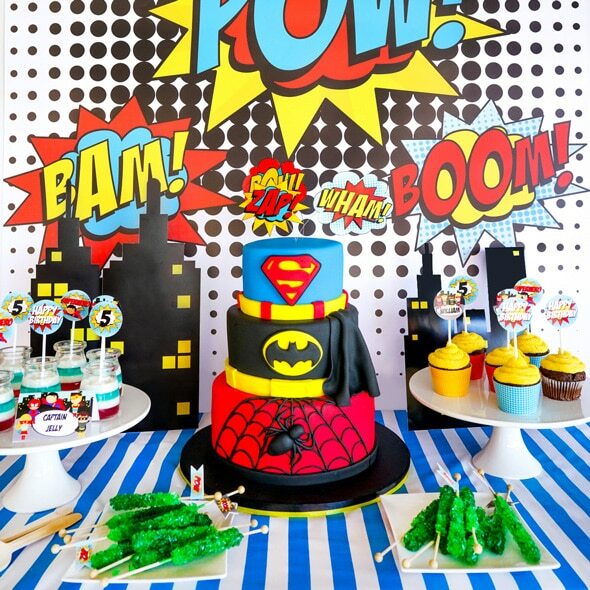 So, Sunshine Parties brought on the lightning bolts and zapped up some kryptonite to pull this colorful, magical and vibrant superhero shindig together! 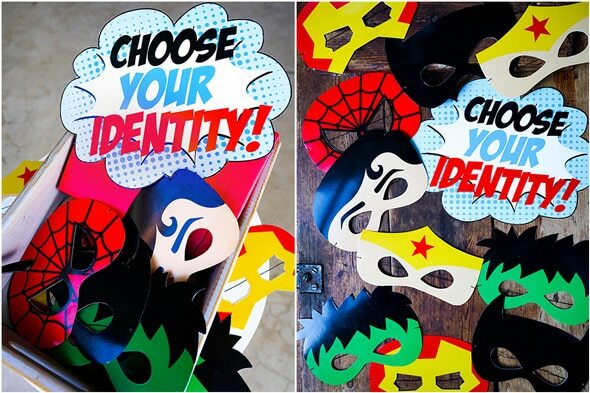 Look at those fantastic printables! Look at all of these delicious treats that made their way onto the dessert table! 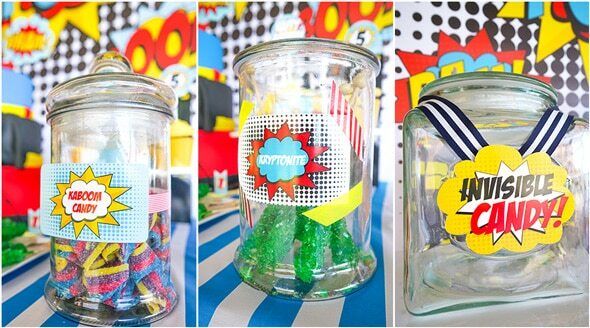 From fun Captain America jello, to perfectly decorated cupcakes, all of the guests were bound to find something they loved! 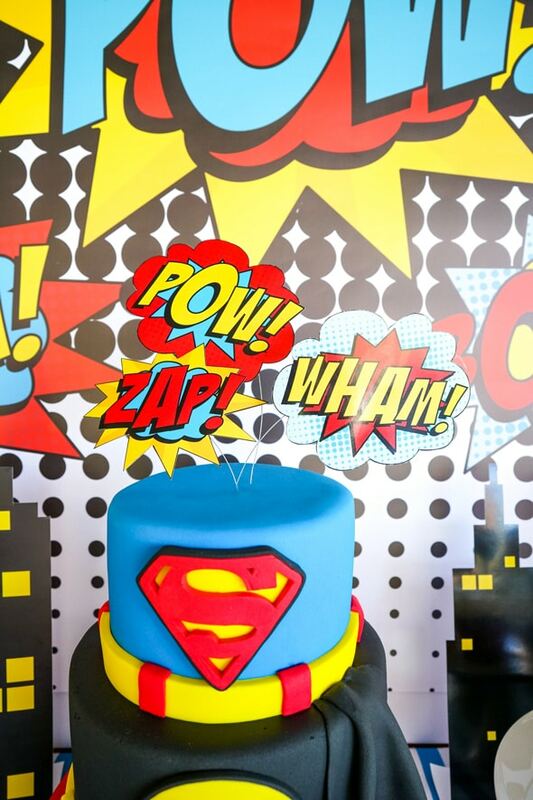 Gracefully Baked whipped up the three-tiered confectionary of super-power cake. An amazing, brightly-colored cake like this one makes for an awesome party table centerpiece, all the little ‘oooohs’ and ‘aaaahs’ make it totally worth it! 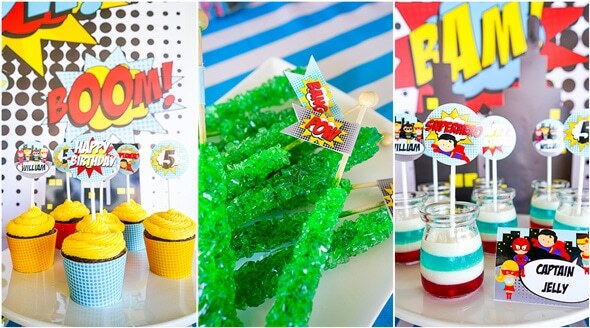 Even the drinks were dressed up to celebrate this Superhero Birthday Party! 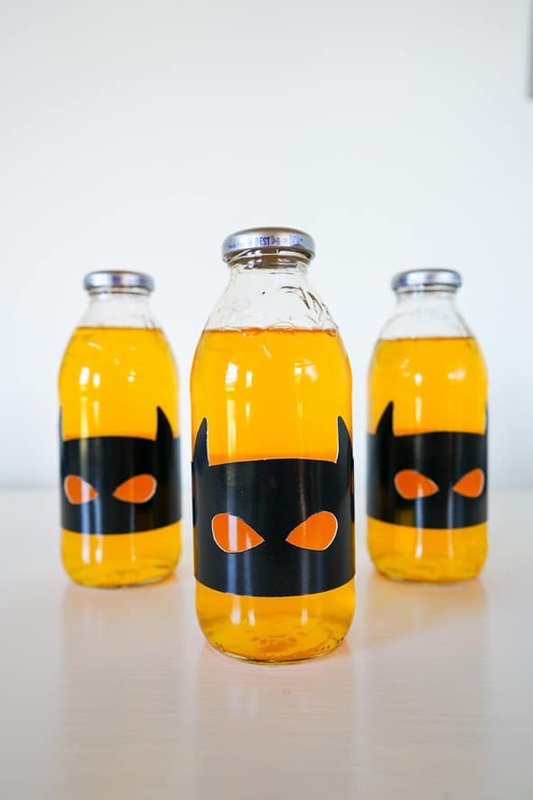 We just love the masks around the drink containers! 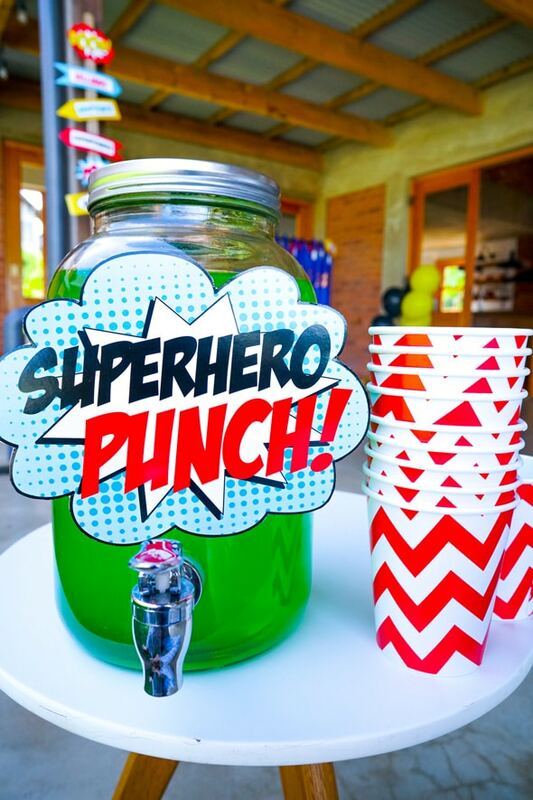 The Superhero Punch kept everyone hydrated from their fun activities around the event! Sunshine Parties turned to some friends for some inspiration! 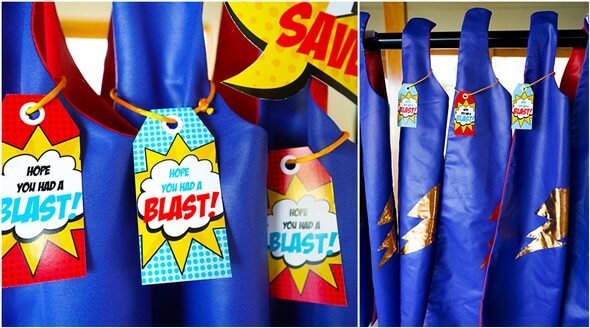 Using a pattern T that had previously been cut for children’s capes, they whipped up 12 x A-M-A-Z-I-N-G double-sided capes for the coveted party favors. They even used a shiny, waxed cotton weave, in both blue and red, so the cape is double-sided! How awesome is that?! 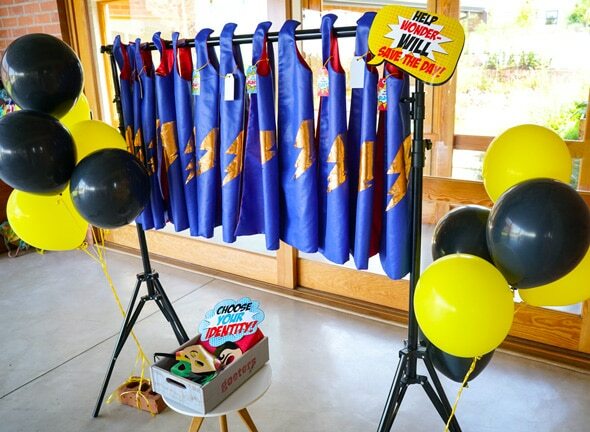 Everyone also got to choose their very own superhero mask, along with “Bat Vision” flashlights to help them fight all of the evil characters in their fun playtime! The kids absolutely loved it! 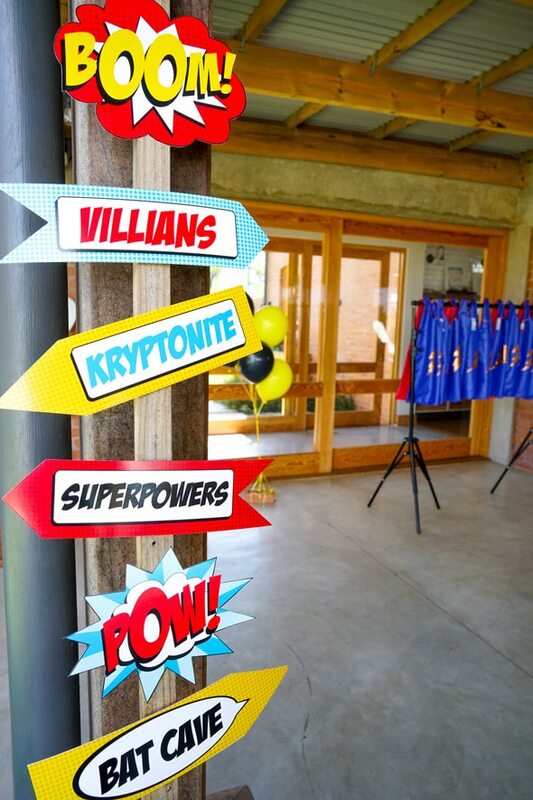 And on the Superhero Birthday Party rocked! 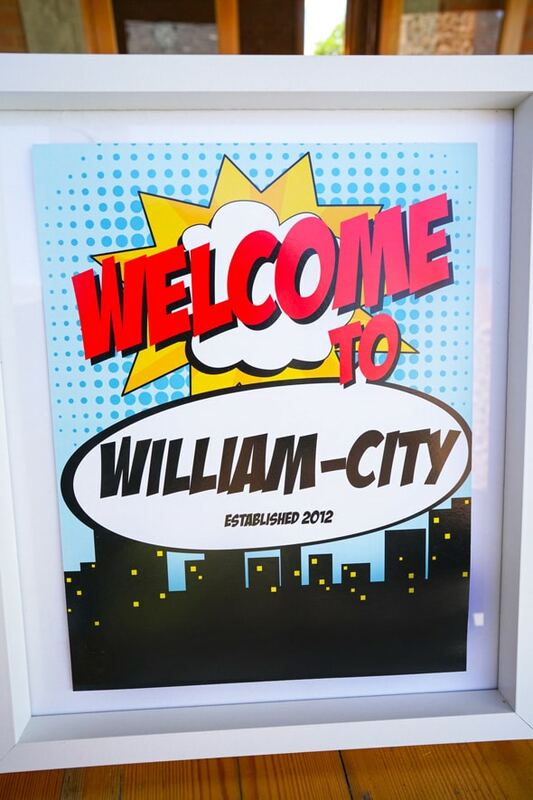 There was no need for entertainers because the capes and choice of superhero masks were more than enough! The birthday boy and his friends scampered (or flew, or climbed, or swooped) around the venue, having a marvelous time during they entire party. They were definitely super charged with kryptonite! 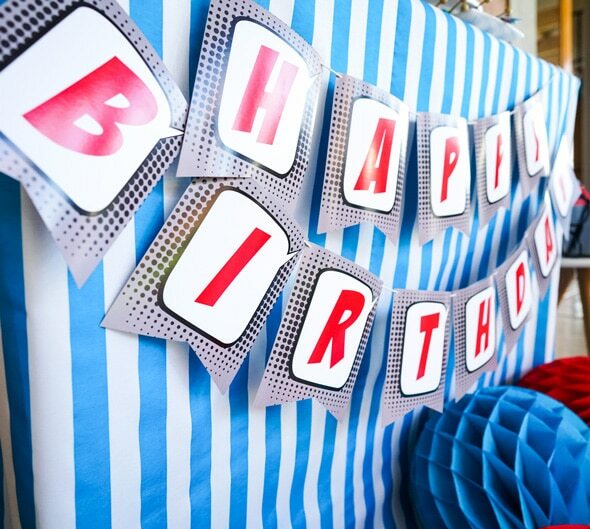 What a perfect theme for a little guy’s birthday!